The two galleries, separated by a bridge over the Serpentine Lake, offer weird little bastions of art in a park full of dog walkers, joggers and meandering tourists. Small and free to attend, these hold a unique pace place in the London art scene, as they are ideal for the casual pop-in visitor who may be intimidated by more snooty ‘pavement-based’ galleries. Recent shows have included the works of Yoko Ono, a very popular performance by Marina Abramović, which saw her sit for 512 hours in silence – queues were snaking out the door into the sunshine for that one – along with a wide range of fun, colourful outdoor installations. The main aim appears to be to deliver non-threatening art, which makes people think. It is therefore interesting that until 14th February next year, both spaces are being devoted to two exhibitors covering technology. These tackle the consumer and business end of the market and highlight just how much this previously niche area has now reached ordinary individuals. 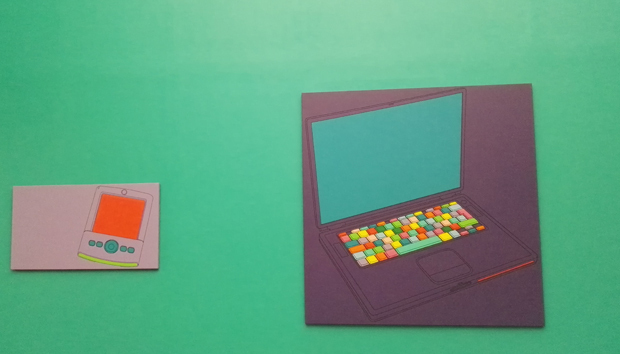 Michael Craig-Martin – who co-ordinated the Royal Academy Summer Exhibition this year – looks at consumer tech. He uses bright block colours and creates flat images of ordinary everyday objects. The exhibition, titled Transience, features images from the light bulb to the iPhone, and are curated with minimal text. The overall effect is very accessible and seems an ideal use of the space. Overall it does seem a very smart, savvy subject matter on Denny’s part. This is an artist who is still in his early 30s and addressed “the way the contemporary world is depicted in imagery used by the NSA” at this year’s Venice Biennale.